Mary Vandeveld was an Obstetrician and Gynecologist in Green Bay, Wisconsin, for many years, and was president of a multispecialty clinic there. 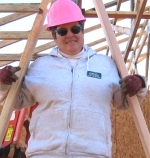 Fifteen years ago, she joined Habitat for Humanity’s RV Care-A-Vanners program, and three years ago she volunteered to be the project manager. As a group, Care-A-Vanners have played a crucial role in the mission of Habitat for Humanity for 25 years, and last year worked almost 120,000 volunteer hours serving more than 600 families. Please check out the Habitat for Humanity RV Care-A-Vanners web page. I joined Habitat’s RV Care-A-Vanners volunteer program 15 years ago. I am also a volunteer manager for the program, serving at Habitat’s headquarters in Americus, Georgia, or wherever our rig is parked. I wanted to write not about myself, but about my friends Clint and Kathy Norrell, two people who are both very special, but also very typical of the heart and soul of Care-A-Vanning. Clint was a construction contractor who also designed and built artistic gates, and Kathy taught first grade for more than 20 years. When they retired, they agreed that they did not just want to sit around at home and occasionally visit their children and grandchildren. So they went way outside their comfort zone and enlisted in the Peace Corps, which sent them to work in Belize for two years. When they got back home to the United States, they experienced the culture shock that people often run into when they are forced to contrast life in a developing country and in the United States. Kathy says they were looking for kindred souls like themselves, people with a sense of adventure who want to do something meaningful with their lives. She heard about the RV Care-A-Vanners program, and they decided to give it a try. In 2012, they went to their first Habitat build in Washington state, and they were hooked. Care-A-Vanners contribute in a lot of different ways, but as a rule a number of them show up to a house that has already been started by a local Habitat affiliate, work for about two weeks or so, and then move on. They might do the first stages of a Habitat house, such as framing the walls, or the last part, such as painting the inside. At the build site, all the volunteers are there for the same reason: to do something worthwhile and to help someone else. The Norrells, myself, and all the Care-A-Vanners are there because we believe in Habitat’s mission of bringing people together to build homes, communities and hope. Habitat’s efforts are about offering a hand up to families in need of decent shelter — partner homeowners contribute “sweat equity” hours helping to build their homes and homes of other Habitat families, and they purchase their homes through affordable monthly mortgage loans. Clint and Kathy have been Habitat Care-A-Vanners for two years and have helped build 12 houses in places like Alice, Texas; Columbia Falls, Montana; West Liberty, Kentucky; and Port Townsend, Washington. They are on the road about seven or eight months a year, but not all in one stretch. And some of that time is spent visiting their children and grandchildren, as well as friends they have made from the Peace Corps and Care-A-Vanners, in addition to building homes. As they move around, Care-A-Vanners become a network of good friends as well as a network of volunteers. On the builds where Kathy and Clint serve as team leaders, they invite all the volunteers to gather at the end of each day for refreshments and snacks. They share and talk about things that have happened on the build site, and they maintain that this downtime is when some of the most meaningful personal bonds are formed. The Norrells also were part of the first group to take the program’s disaster response course, during which they learned how to be able to move quickly and respond when an area has been hit by a natural disaster such as a hurricane or tornado. The course was held in Americus, which is right next door to Plains, Georgia, home of former President Jimmy Carter and his wife Rosalynn. The Carters still lead Habitat’s Jimmy & Rosalynn Carter Work Project for one week every year. President Carter is at the top of Clint Norrell’s hero list, so they went to see him teach Sunday school at Maranatha Baptist Church in Plains, which he does regularly. Clint remembers President Carter saying: I don’t care if you’ve been in the Peace Corps or if you build with Habitat, don’t pat yourself on the back for what you’ve done. You can do more. Now get up and go do it. Good article and certainly highlights the Norrells. We enjoyed working with them in West Liberty. Clint is also an author and comedic artist. Kathy and Clint are an interesting couple to say the least. How does one get started in care-a-vanning?